South Beach Smoke is one of the most popular top rated brands, with high quality products and accessories. Their vaping device is high-tech, nicotine cartridge doesn’t leak, and there is no on or off switch on the e-cigarettes. As you inhale, the orange LED light at the tip glows like a real cigarette to let you know it’s working. It will also flash to let you know it’s time to recharge the battery. A starter kit contains the elements every vaper needs to successfully vape. These items include at least one rechargeable battery, a USB charger at a minimum, and two or more pre-filled flavor cartridges. As kits become more impressive and appeal to individuals who decide they want to vape in the long term, their kits are padded with AC adaptors, more cartridges, and other useful items. Pictured here are some of the South Beach Smoke flavors you can choose from. They come in a variety of strengths from 0mg nicotine up to 24mg nicotine. Flavors include a number of mint styles; orange, watermelon, menthol, and peppermint. Several tobacco varieties include Golden, Blue, and Classic tobacco, each described fully so you can compare it to the cigarettes you used to smoke. Fruits, desserts, and drinks create a decent assortment. South Beach Smoke also offer disposables available in packs of four, 8, or 12. 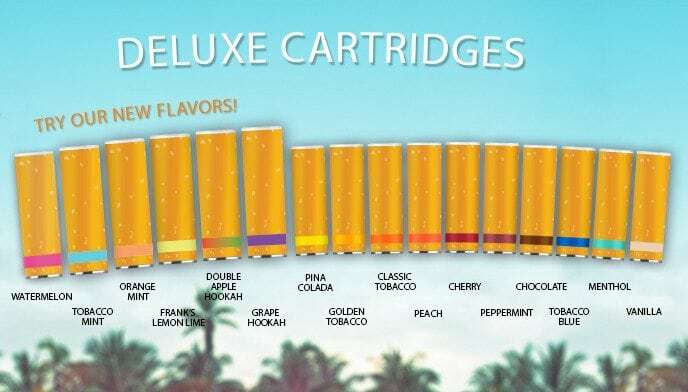 If you find that a bit expensive considering many companies sell them one at a time, this pricing means that divided by 4, a price of $11.99 works out to $3 for each disposable electronic cigarette. One of the things I like most about South Beach Smoke is their Portable Charging Case which looks like a traditional cigarette box except that it lets you charge your batteries on the go.